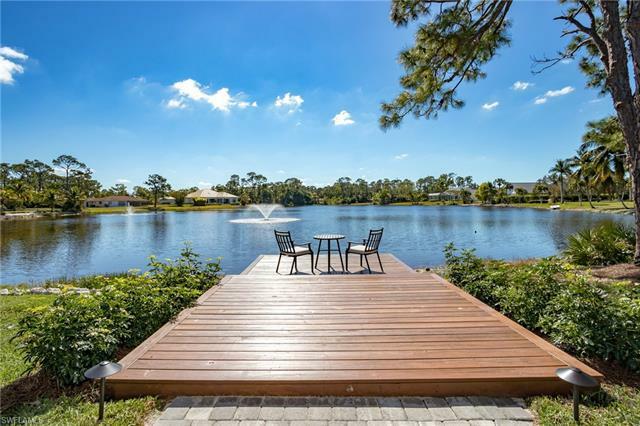 H. 13631 - charming lake front, classic florida style home built in 2003 offers a striking blend of casual living and upscale finishes throughout its 4,193 sq. Ft of living area. Beautiful, long water views of spring lake; just 5 blocks to the beach and 3 blocks to 5th avenue s. Timeless architecture with metal roof, decorative shutters and inviting front porch. Gorgeous wide plank wood flooring, tray ceilings, gas fireplace, insta-hot system, detailed millwork, wet bar, generator, impact glass, 2 yr. Old hvac system. Gourmet kitchen open to the family room; tasteful cherry cabinetry, marble counter-tops w/subway tile backsplash, top-of-the line appliances including thermador gas range, island with extra sink and breakfast bar. Spacious 1st floor master suite boasts dual vanities, separate tub, large shower, his/her walk-in closets; french doors to patio. Open lanai is perfect for entertaining with its infinity edge pool/spa and summer kitchen overlooking the sparkling lake views. Guest bedrooms upstairs have balcony. Live the perfect olde naples dream in this delightful home! Shows brand new!! Welcome to whispering pines on lake egret. A lakeside luxury home located in the prestigious community of pine ridge estates along with a 2 bedroom 2 bath guest house! Over 4300sq. Ft of a/c living area including guest house! Completely made over and will astound the most discerning buyer. Whispering pines has been transformed into a west indies style home that will make you feel like you are always on vacation. Some of the upgrades include new metal roof, new impact windows, new kitchen, newly installed paver driveways, new reverse osmosis system, new front elevation, sonos system, new security system, new solid core doors, new lighting fixtures, boat dock, private fountain, landscape lighting. The list goes on! You'll love the guest house! Loads of fl sun!! All this located less than 2 miles to the beaches, waterside shops, mercato and the artis! With lake front homes being quite scarce, this home will more than likely move quick. The last home that sold on lake egret sold for $3. 5 million and there is one currently pending at $4 million. Pine ridge estates was recently rated best neighborhood in america. There is a home warranty with this home! Beautiful 2. 02 acre lake front wooded lot in pine ridge estates! Breathtaking wide lake views! Very private, yet location is central to all that naples has to offer. Less than 5 minutes to waterside shops and mercato. Lot includes an existing 1,400 sq/ft +/- air conditioned garage, large enough for rv, boat or recreational vehicles. Plans for a 9,200 sq/ft custom estate home are included and the site is ready to build. Or design your own home! Seller will consider a real estate trade. This spacious, beautifully renovated lake front home is within walking distance to fine dining, shopping, and the beach! Recently remodeled to include a gorgeous updated kitchen and bathrooms, hardwood flooring, impact windows, exquisite light fixtures, and lush landscaping. This three-bedroom, 2 bath home is the perfect opportunity to own your own piece of paradise. Park shore residents are also eligible for membership to the park shore association as well as the ability to purchase or lease boat slips along gulf shore blvd.